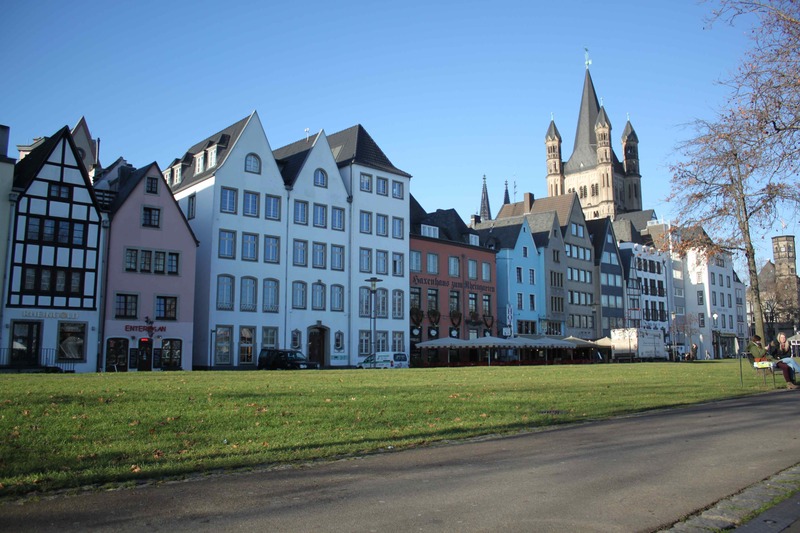 Blue skies and sunshine in Cologne on Friday morning :-). 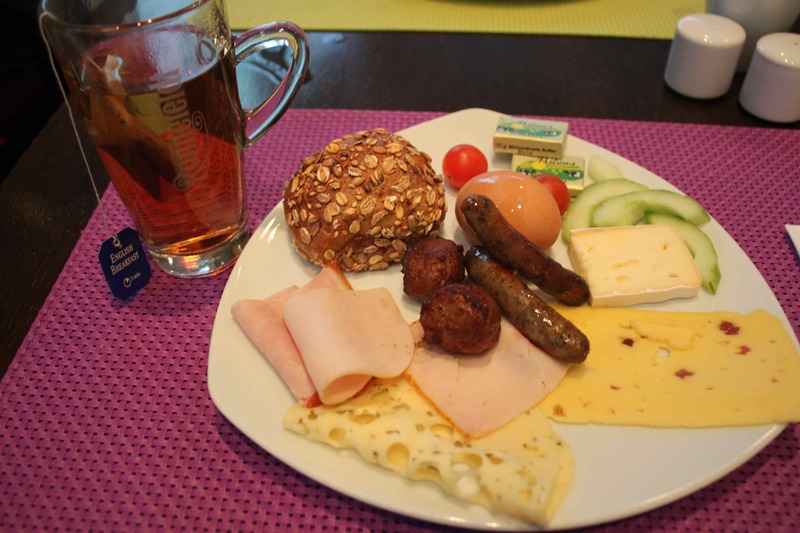 We started our day with an excellent breakfast in the hotel before setting off to visit the Christmas Market beside the Dom. 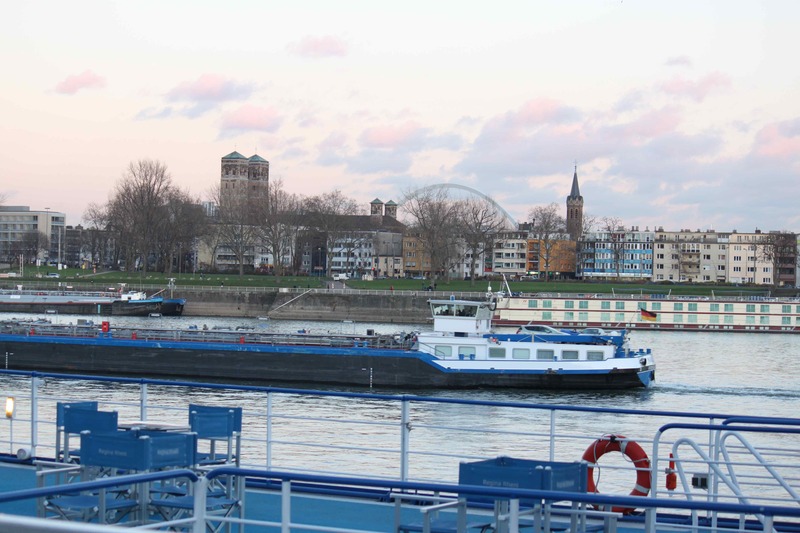 We strolled along the side of the Rhine towards the City Centre. 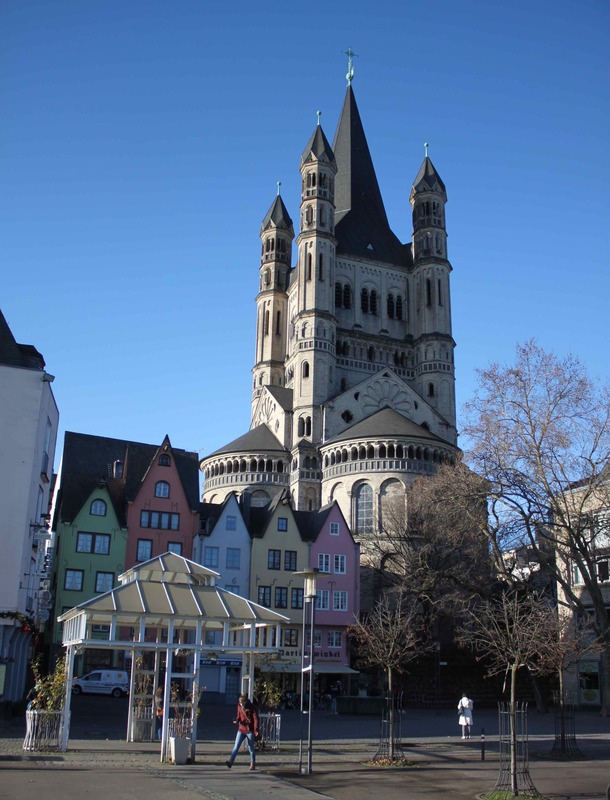 Like many cities in Europe there is a fascinating mixture of old and new architecture all mixed up together. 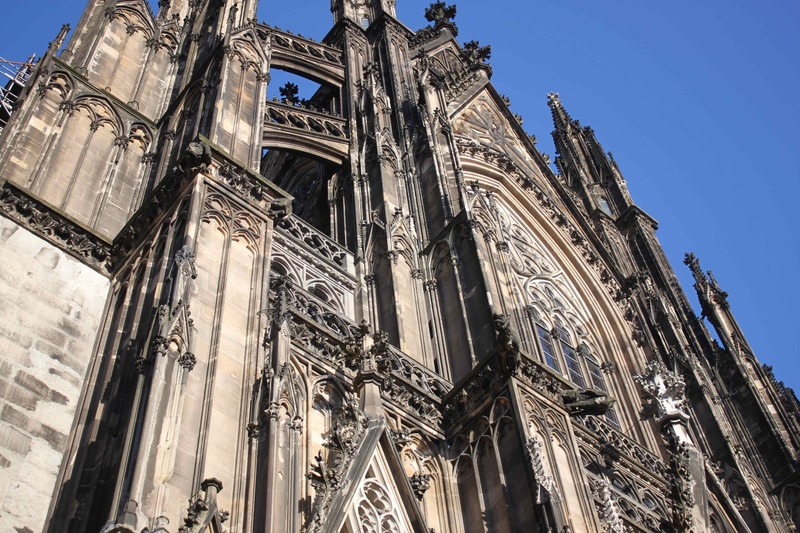 Enormous churches dominate the skyline. 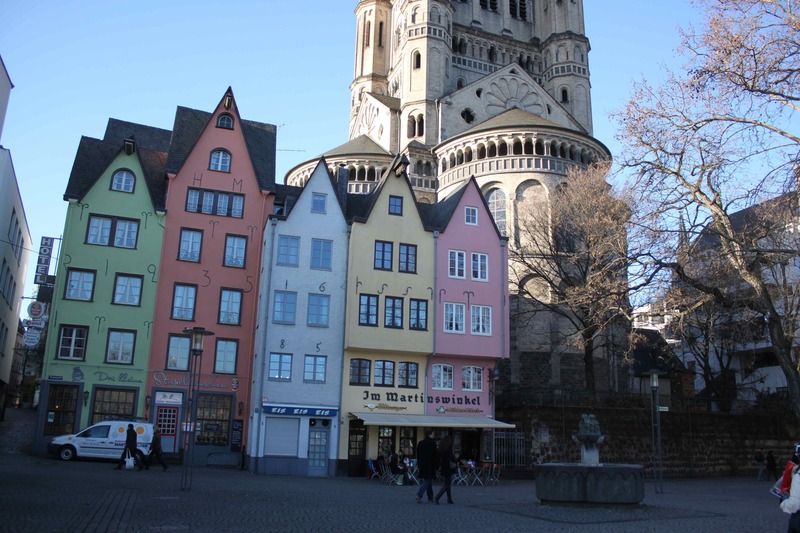 These little colourful buildings are adorable. A few minutes later is this very modern museum. 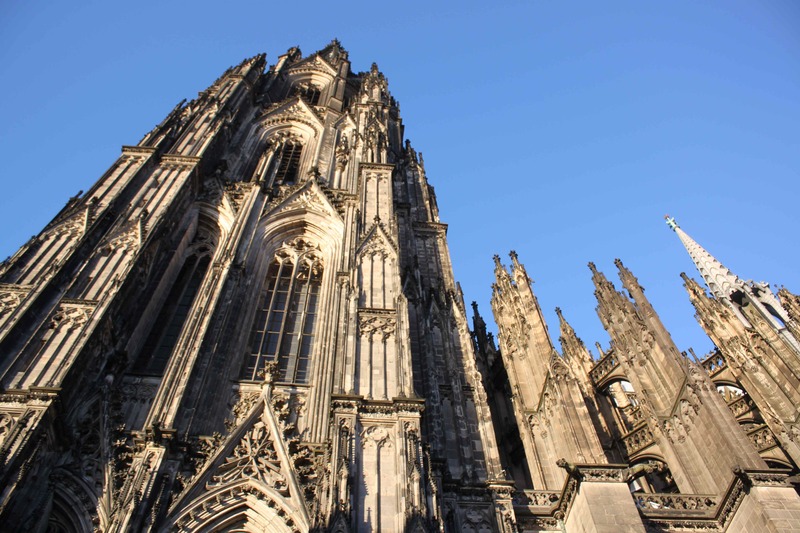 Which is next to Koln cathedral. Also known as ‘The Dom’. 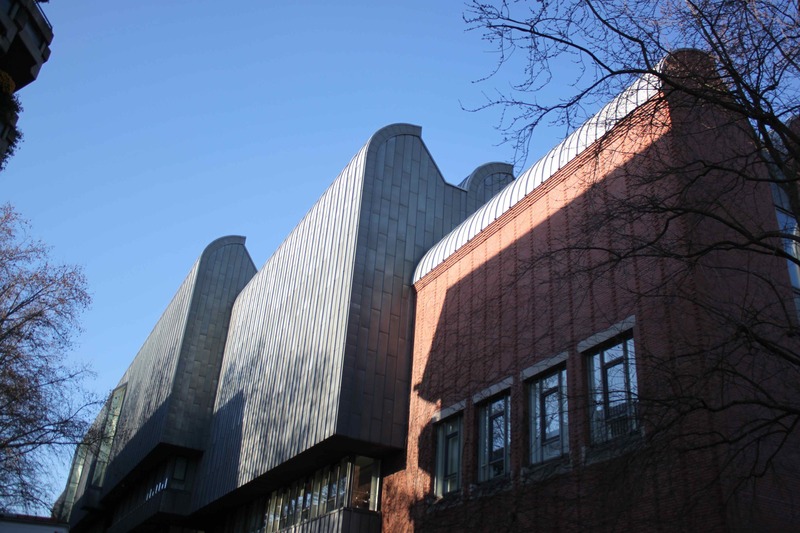 This building really is too magnificent for words. Everything about it is just stunning. 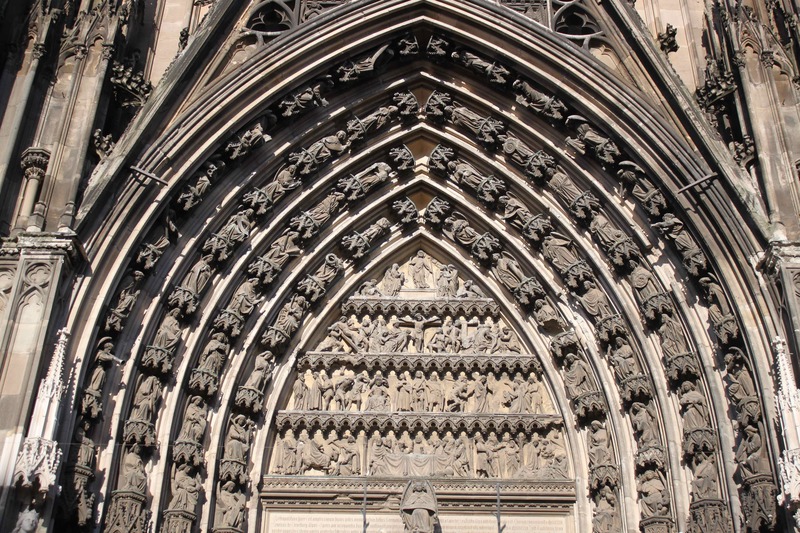 Look at the detail on the stone sculptures which adorn the entrances. We were lucky the sunshine showed it off in its best possible light. 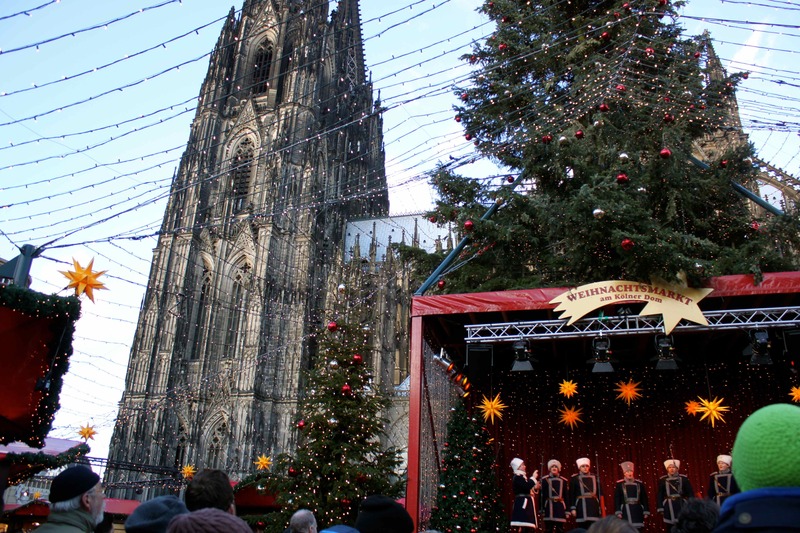 A strange thing about Cologne is that it never seems to be too early for a Gluhwein! 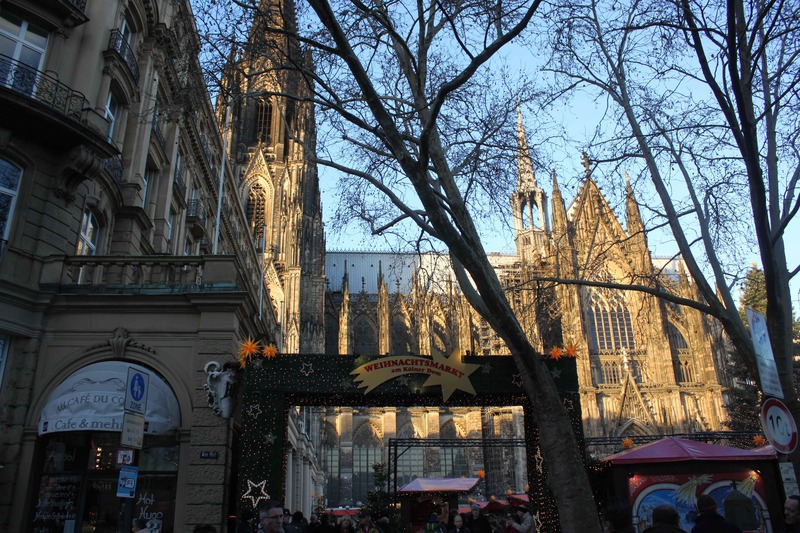 The Christmas market at Cologne Cathedral is the largest of Cologne’s 7 Christmas markets. 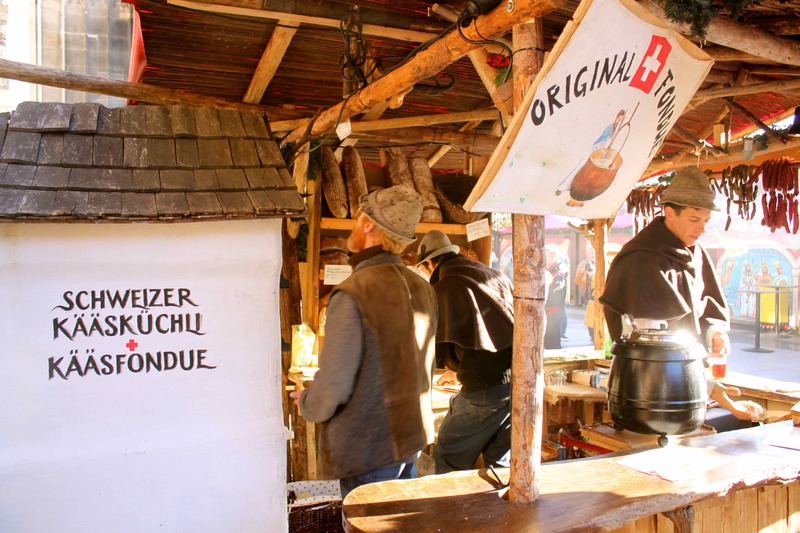 The stalls sell a wide variety of food, drink and items to buy. It is so very enjoyable to wander around, looking at the things for sale, eating, drinking and generally soaking up the atmosphere. This is how Christmas shopping should be. 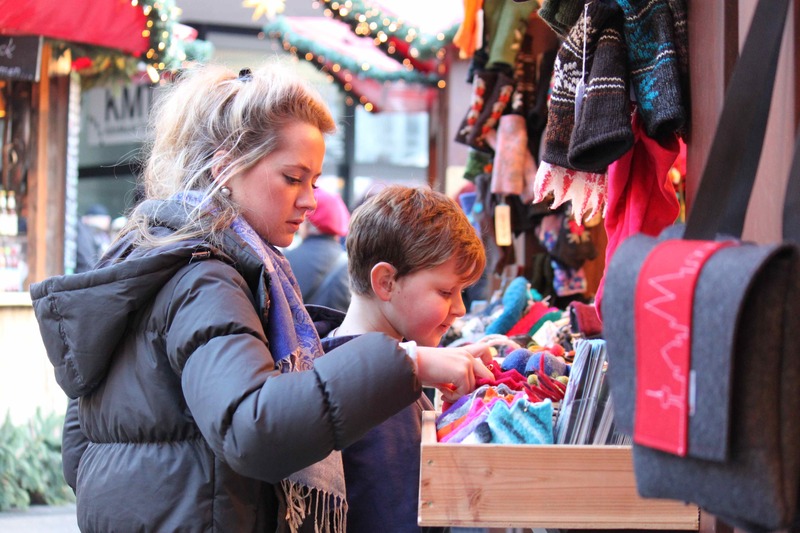 It is much more fun than coping with the crowds in a large shopping centre or high street and infinitely more pleasurable than shopping on-line. I was just disappointed I had finished most of my shopping before I came away as I kept seeing things I thought my family would like. Not having an itinerary to have to stick to meant that when we saw somewhere we liked the look of, such as this charming chalet, we could go ahead and indulge ourselves. What shall I have to drink? 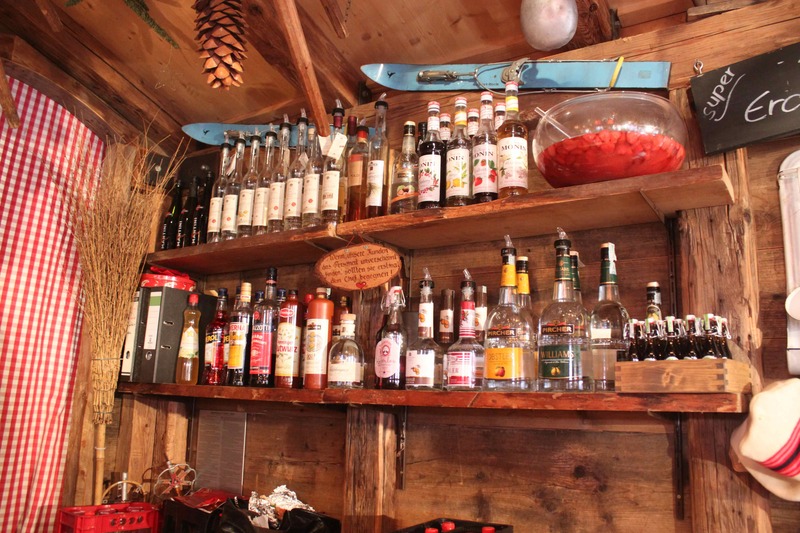 This cute bar and restaurant was done up in the style of a South Tyrollean chalet. It was very cosy in there. 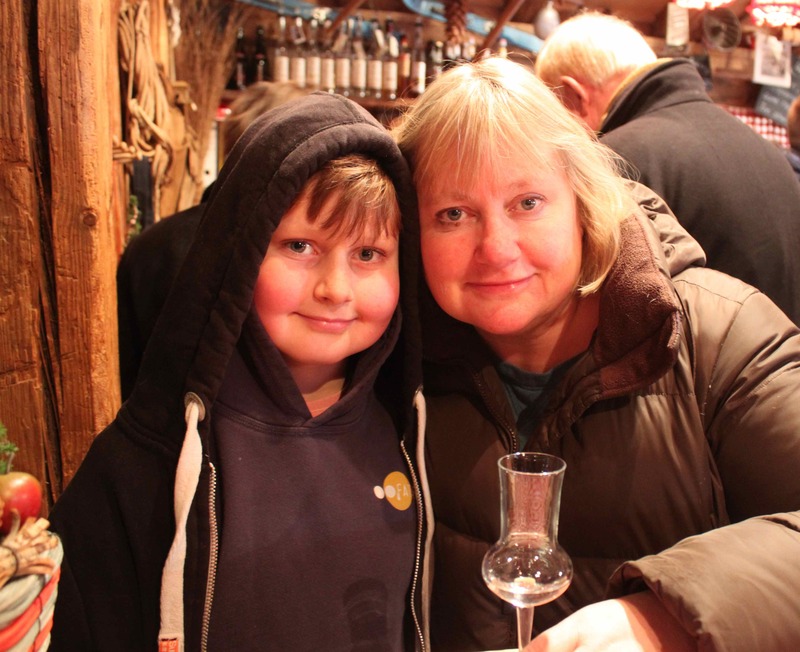 James and Lara enjoyed a mulled wine made with white wine and I had a raspberry Schnapps. What next? I had resisted lots of food all morning and eaten nothing since breakfast. 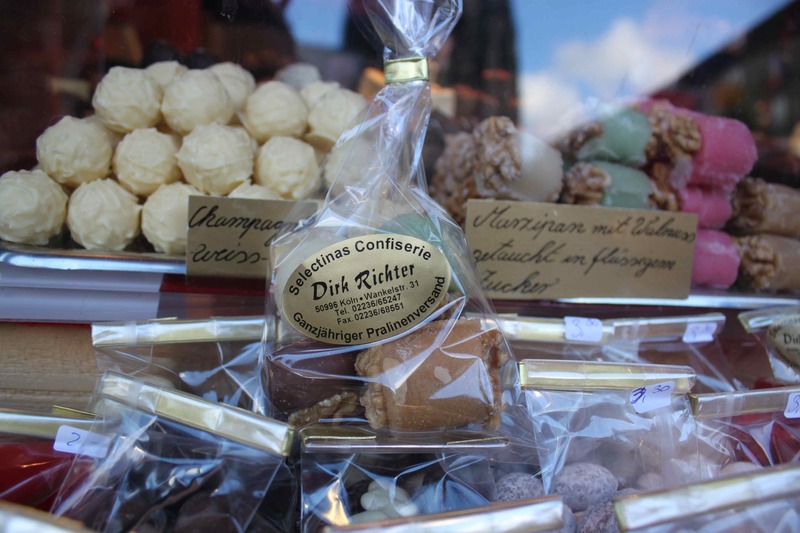 This amazing chocolate stall got the better of me though and I chose 4 sweet yummys; 2 chocolates and 2 marzipan. 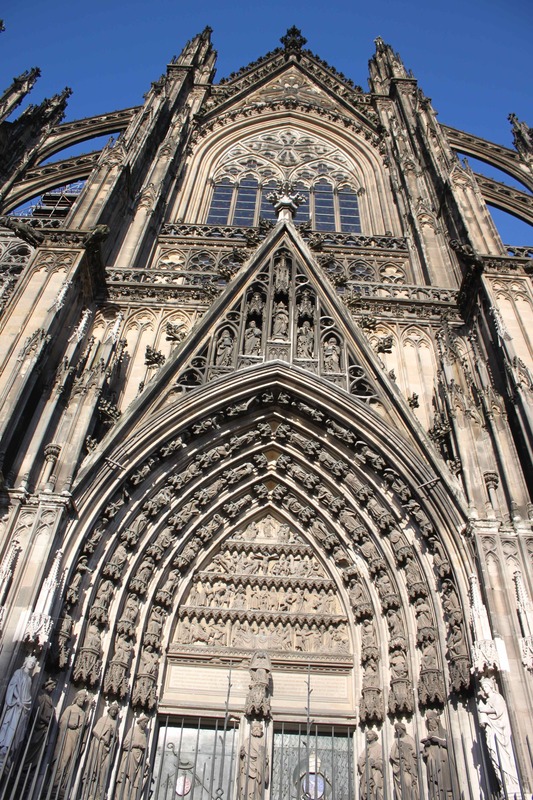 We wanted to actually go inside the cathedral or “Dom” as it is called locally. So we did. WOW!!!!! 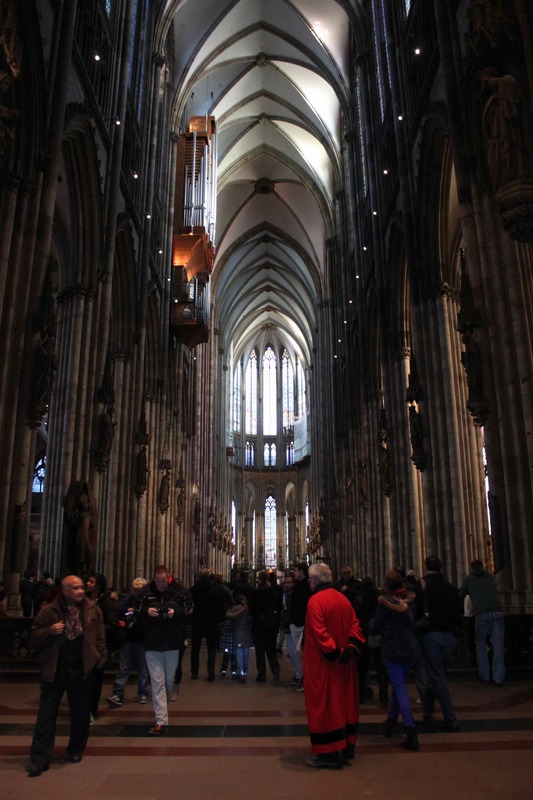 The scale of this incredible building is extraordinary. 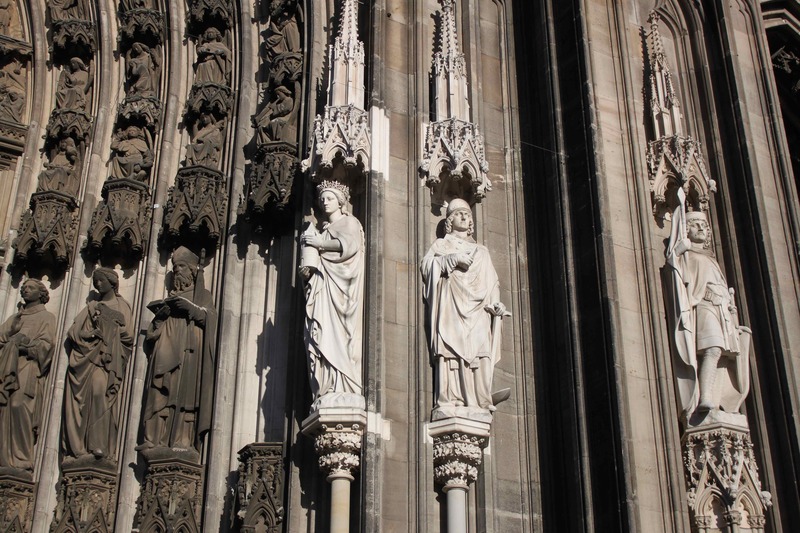 It took over 600 years to build and I think they did a remarkable job. 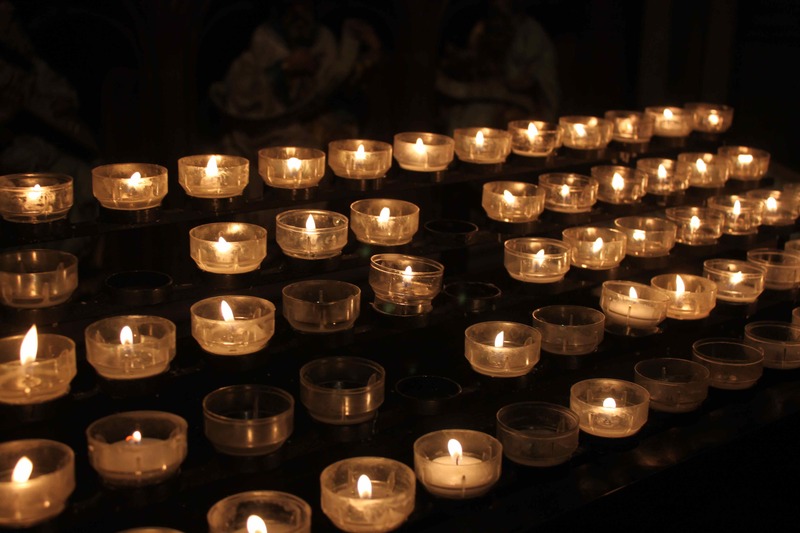 I lit a candle for my Mum. Harvey lit one for Storm (a deceased cat). 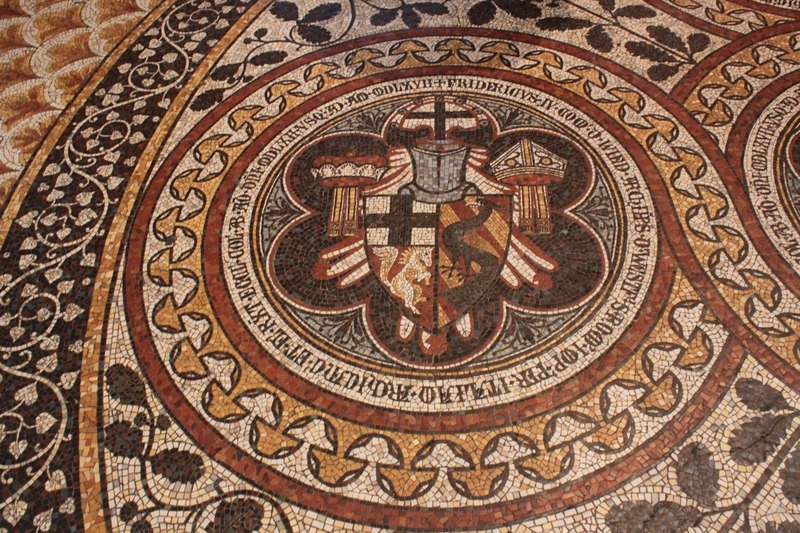 The cathedral is generally quite spartan inside but there are areas which are decorated, such as this floor which has a beautiful mosaic pattern. 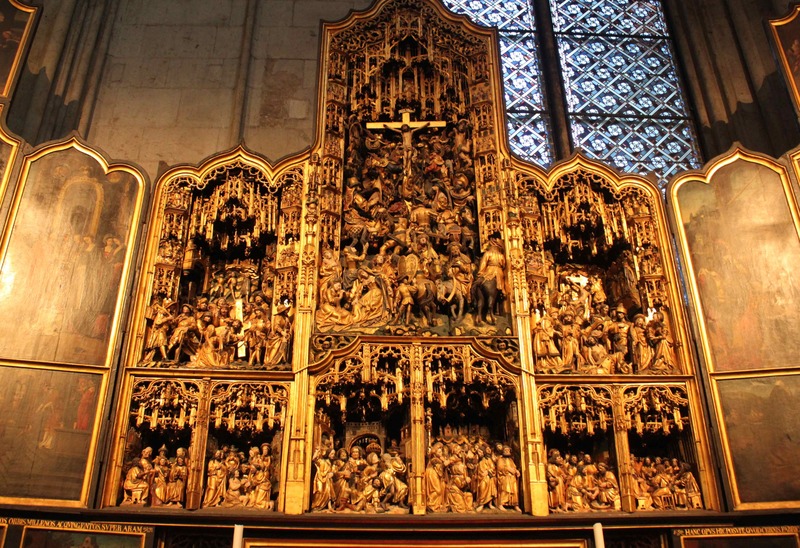 The craftsmanship on this piece was superb. 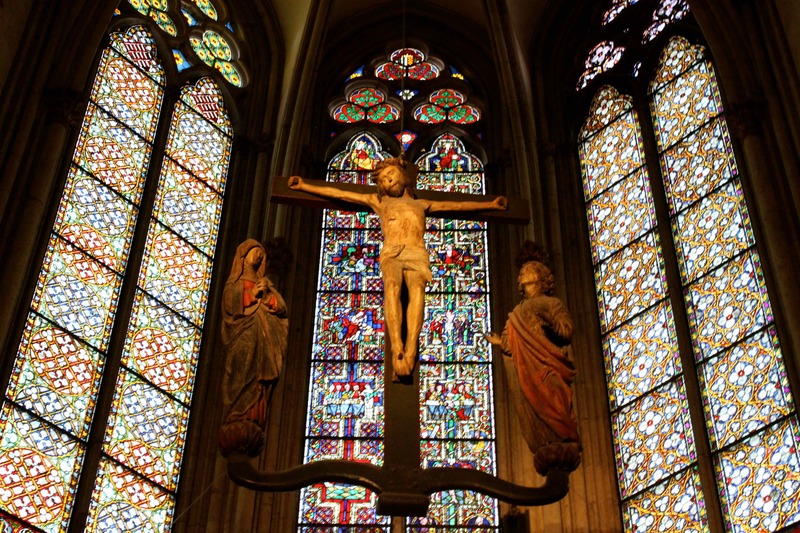 Much of the stained glass was very impressive too. 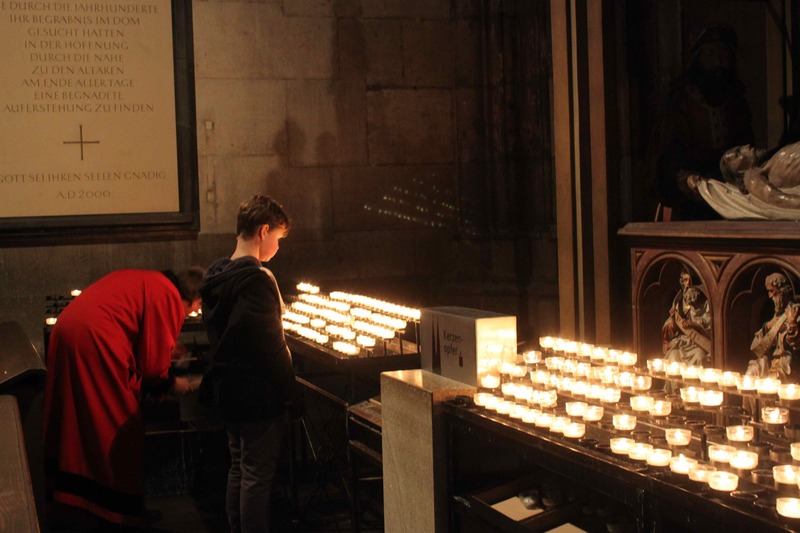 We all enjoyed looking around and admiring the cathedral but all preferred to enjoy it from the outside as it was such a lovely day. It was about 10 °C so very pleasant. 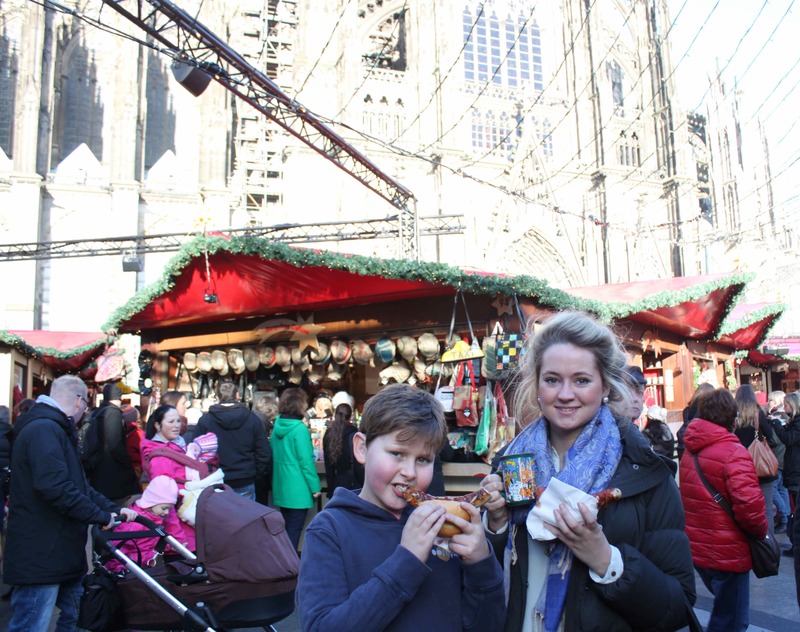 Before leaving the market beside the Dom we had something to eat. 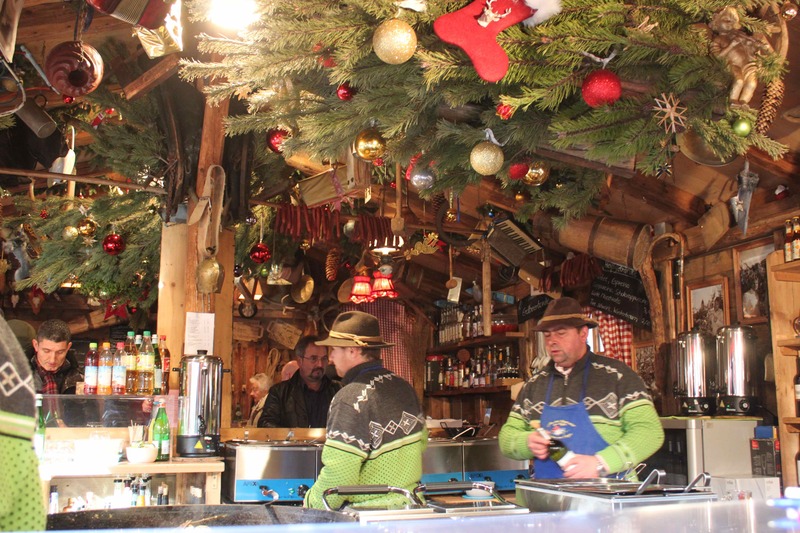 I hesitate to call it lunch as it was very late by the time we chose a fondue, served by some very charming Swiss men. 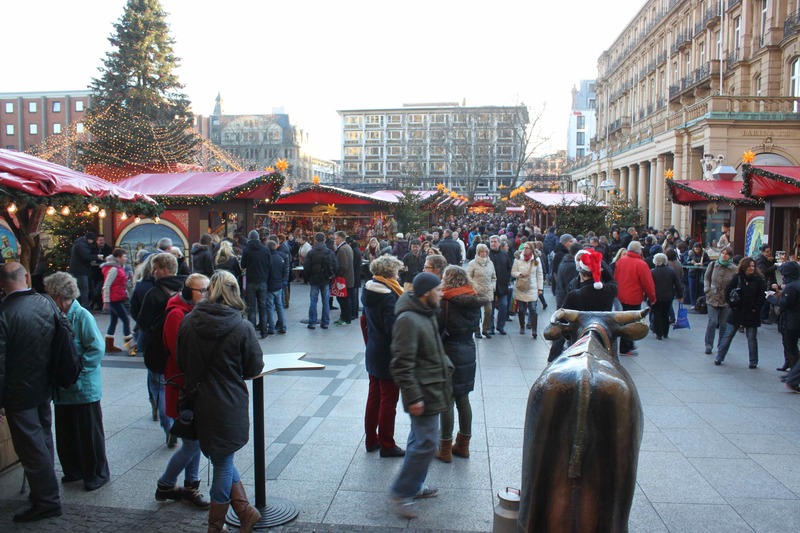 This was our view of the market while we ate – we had the Dom behind us. It was very bust by the afternoon. 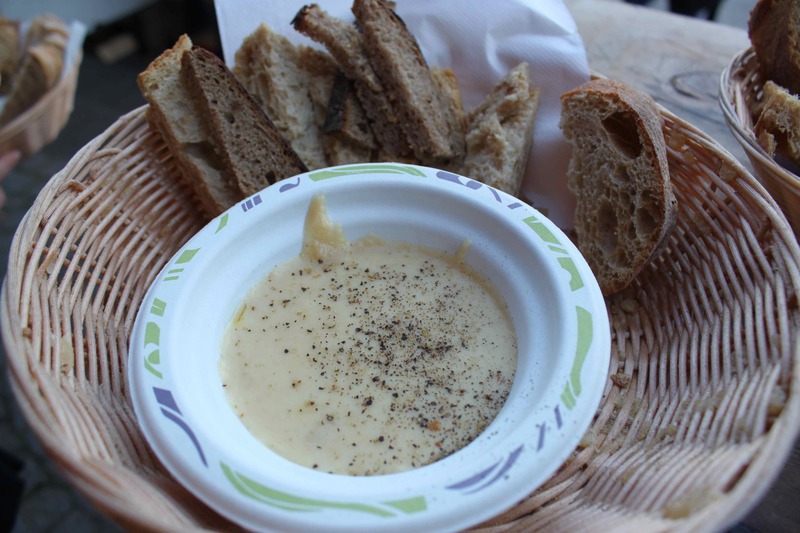 A very good fondue, served with a mixture of bread. For those of you who have not enjoyed such a delicacy, a fondue is melted cheese with white wine and Kirsch added to it. 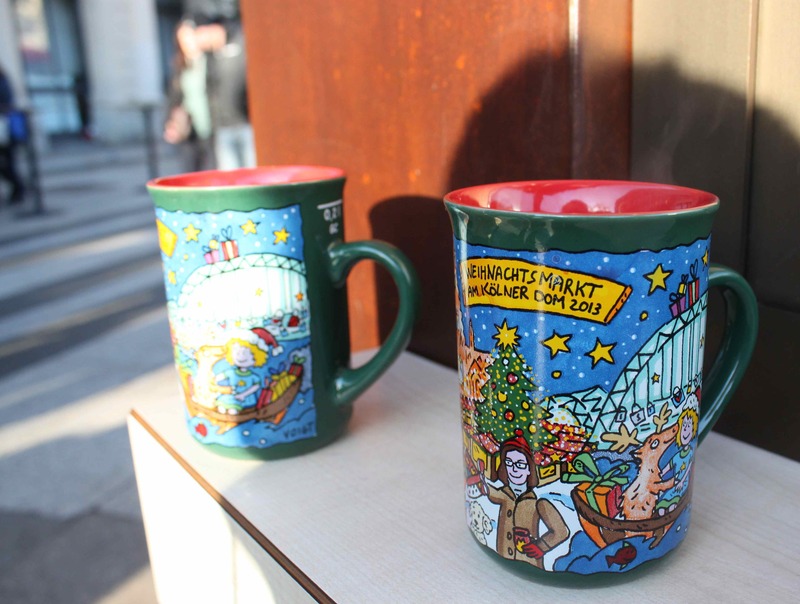 We loved this Christmas market. 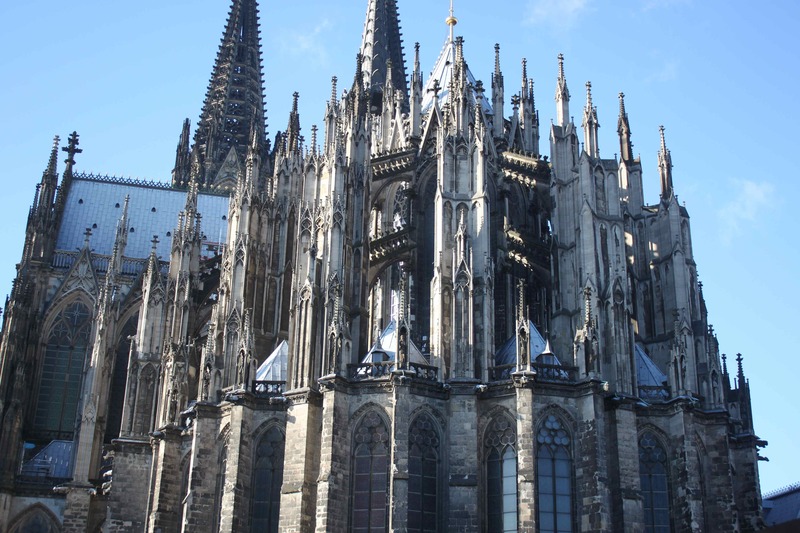 We would have travelled to Cologne to just visit this one and would have thought it was worth the trip. 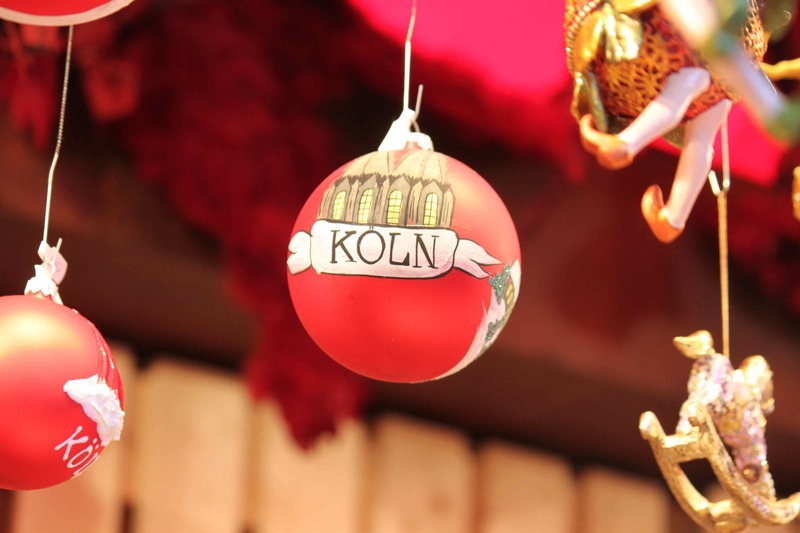 How wonderful to think Cologne has 7 markets to visit! 2 down, 5 to go. It was quite hard to leave. The walk back to the hotel along the Rhine was well timed to coincide with a pretty sunset. After all that gluhwein fresh air a little siesta was required ;-). We then set off back to the market next to the hotel for supper. 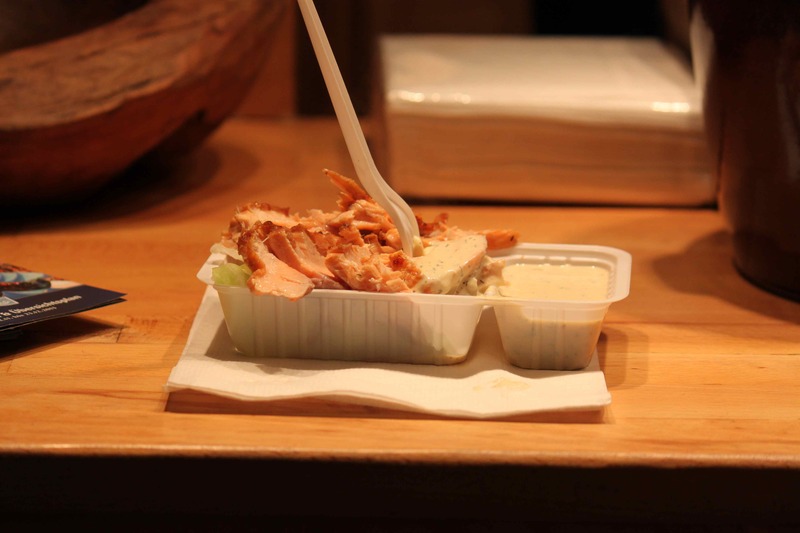 I had a portion of the hot smoked salmon with a honey, mustard and dill sauce, served on a bed of iceberg lettuce. The salmon was sublime – perhaps the best I have ever had. It was full of flavour, succulent and perfectly cooked. It wasn’t quite enough though as apart from a fondue and some chocolates, I hadn’t eaten anything since breakfast. 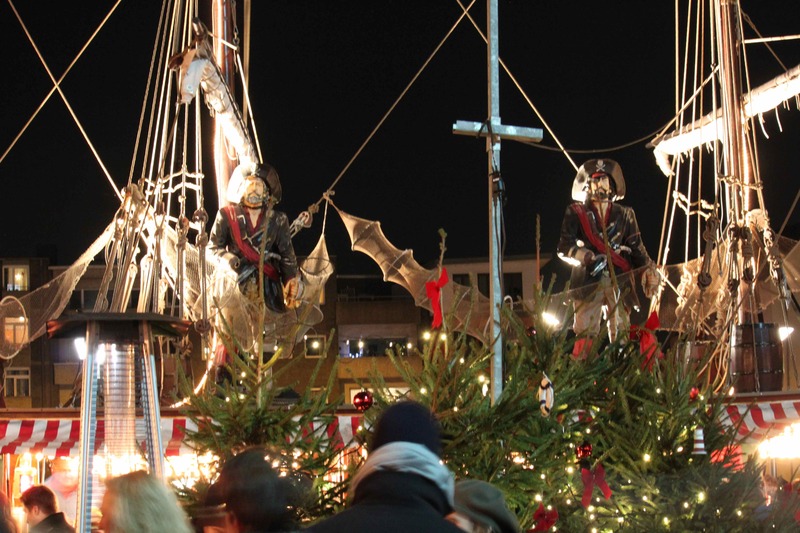 The pirate ship provided a gluhwein to help keep us warm while we pondered what to eat next. A ha! I know. 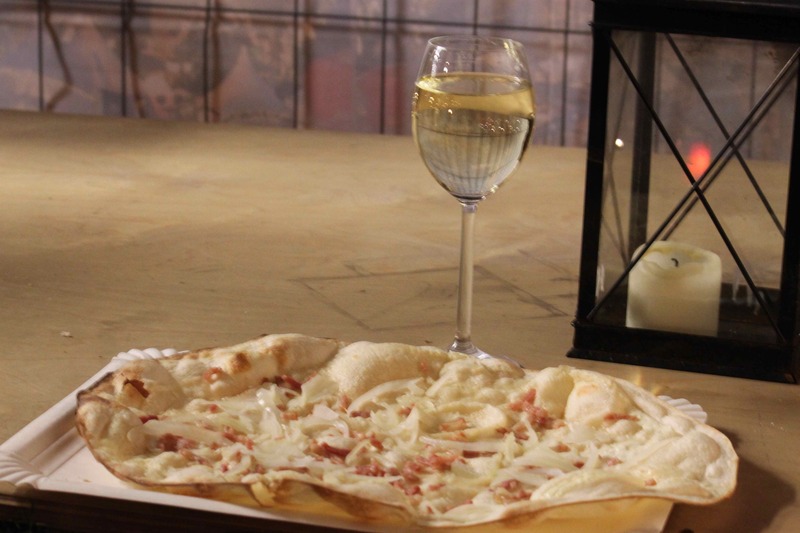 A Flammekuchen with a glass of white wine from Alsace. This was fantastic. Flammekuchen is similar to a pizza but the crust is impossibly thin. One crunch and it is gone. It is spread with a thin layer of sour cream or whipped cream cheese, tiny pieces of onion and ham. The wine went with it perfectly. A delicious and enjoyable end to a wonderful day.